Avid, if haphazard, collector of postcards and information about women in the Music Hall. Easily diverted by new themes. Today male impersonators, tomorrow long boot dancers. The Brighton Hippodrome started life as a skating rink and then became a circus before finding it’s true calling as a venue for dramatic and variety performances in 1902. Tucked away in a narrow side street the rather plain exterior hid a glamorous venue designed by Frank Matcham, the theatre architect extraordinaire. It held around 2000 people and had five bars, refreshment rooms, lounges and promenades, warehouses, stabling and a large open yard. Before the grand opening a journalist from the trade paper, the Entr’acte, remarked that the facilities for dispensing liquors are very considerable while an advert for musicians states that evening dress and sobriety are indispensable. There was to be an orchestra of eighteen musicians, all to be experienced in the variety and circus business, and a first violin, piano, cello and bassoon were needed to complete it. In July 1901 first-class acts of all kinds were directed to write immediately to secure their bookings. We know that the biggest music hall stars of their day appeared at the Brighton Hippodrome, including Marie Lloyd, Vesta Tilley and Hetty King. Vesta Victoria, a very popular singer and comedian, had an off-stage adventure during her time at the Hippodrome in 1906. She went for a moonlight motorboat ride with some friends and when they were seven miles out to sea the petrol for the engine caught fire. They couldn’t put out the flames and the Derby Daily Telegraph reports that just when the situation appeared to be desperate, Miss Vesta Victoria lit upon the expedient of tying her motor-veil to a boat-hook and of waving it in the moonlight. This was seen by fishermen who rescued the group and brought them ashore. In her autobiography, Vesta Tilley tells of her experience in Brighton when playing the Hippodrome in the First World War. As Brighton was a coastal town no lights were permitted at all and she says she was obliged to literally feel her way from the Hippodrome to the Metropole Hotel each night after the performance. On one particularly dark night she and her maid found their way to the seafront and Vesta suggested guiding themselves by the railings. They finally realised they were getting no closer to the hotel and found they were walking round and round a small circular garden in the centre of the road. VestaTilley is reputed to haunt the Brighton Hippodrome, but in a dress rather than stage costume, and there is said to be a whiff of her favourite perfume backstage. In 1921 Marie Lloyd appeared before the Duke of York (George VI) and the Prince of Wales (Edward VIII) at the Hippodrome and received the royal approval in that the ‘democratic‘ Prince of Wales applauded the performance despite the fact that it was not customary for royalty to applaud in theatres. So in the year before she died Marie was accepted and appreciated by the establishment. To end with a bizarre story – in March 1907 the Mid-Sussex Times reported that the musical director at the Brighton Hippodrome had written to say that one of his hens had laid an egg weighing over five ounces. The egg could be seen at the Hippodrome any evening. This entry was posted in Brighton Hippodrome, Music Hall, Music hall artistes and tagged Brighton Hippodrome, Hetty King, Marie Lloyd, Vesta Tilley, Vesta Victoria on June 10, 2017 by Monomania. Ada Reeve was born in London in 1874 into a theatrical family and she made her debut at the age of four in the pantomime Little Red Riding Hood at the Pavilion Theatre, Whitechapel. Using the name Little Ada Reeve she continued to appear in plays and pantomime to great acclaim. Her elocution was said to be ‘peculiarly free from Cockney taint.’ In an advertisement in the trade paper, the Era, in May 1884 Little Ada Reeve announced she was at liberty for speciality and Christmas for the principal child’s part and was said at ten years of age to be a singer, actress, dancer, reciter and drum soloist. Ada turned to the music hall when her father became ill as a way of earning more money to support her large family. Her first appearance at the age of fourteen was at the Hungerford Music Hall, better known then as Gatti’s-under-the-Arches in Charing Cross. She delivered comic songs, the words of which she is reported to have spoken with a little singing at the end of each line. She was a dainty dancer and not averse to finishing her act with a cartwheel across the stage encouraged by the audience shouting, ‘Over, Ada’. Eventually she gave up on this, telling them, ‘I’m grown-up now!’ Her popularity was such that when she appeared at the Hippodrome Portsmouth in November 1907 her name featured seven times in the advertising material with theatre patrons urged to buy tickets at once owing to the great demand for seats. We are told it was a special engagement at a millionaire salary. The rest of ‘the wonderful star company’ is squeezed in at the bottom of the advert. Ada also made a name for herself as an actress and performed in musical comedy travelling to the States, South Africa and Australia appearing in theatres and music halls and winning admirers wherever she went. In interviews she was quick to dispel the myth of drinking champagne out of slippers and insisted it was all very proper with the evening ending with a thank you and goodnight on the doorstep. She received many letters from stage door johnnies and in a production where she played the part of an actress she would sometimes amuse herself by reading out these real billets-doux instead of sticking to the script. In 1905 Ada sued the Weekly Dispatch for misrepresenting her in a published interview. She was read the article before publication and objected to certain content but it was published anyway with her signature as if she had written it. The article stated in a headline that Ada Reeve earned £250 a week and she denied having said this as it was untrue and would make her look foolish and boastful to say so. Other performers had mentioned it to her and it was thought to be in bad taste. She also denied signing the article. The defendants claimed she had not quite understood their intentions but agreed to pay her costs and the action was terminated. Ada was herself taken to court by Millie Hylton, ‘her stage rival’, whose counsel asked for Ada to be committed to prison. She had breached an undertaking not to sing Miss Hylton’s song I couldn’t help being a lady. Miss Reeve said she only sang the song once, as an encore, ‘because she had received so many encores that she did not know quite what to give.’ The judge said that Ada could have forgotten the undertaking in the excitement of the encores. He accepted her apology but she would have to pay the costs of the case. Ada Reeve continued to work as an actress on stage and in film. Her last stage role was at the age of eighty and she appeared in her last film at the age of eighty-three. She died in 1966 at the age of ninety-two. She had that special something which audiences responded to and in this clip we can see that charm and hear that voice, still clear in her eighties. She is talking to Eamonn Andrews after an appearance on the television show This is your life. This entry was posted in Ada Reeve, Music hall artistes, Music Hall court cases and tagged Ada Reeve, Hungerford Music Hall, Millie Hylton, Pantomime on April 4, 2017 by Monomania. 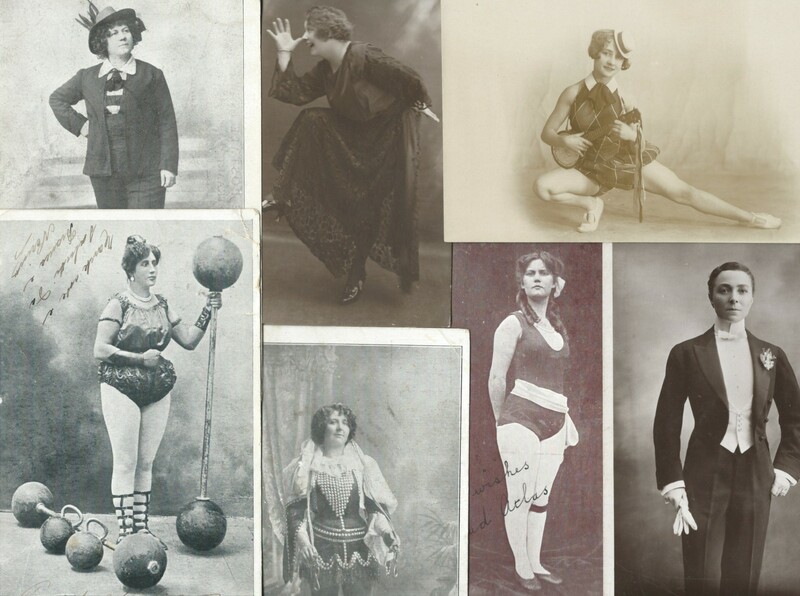 A delve into the postcard collection comes up with some images and captions worth sharing. Hundreds and hundreds of women tried their luck on the music hall stage, living in cheap boarding houses as they crisis-crossed the country hoping for fame and fortune. Some scratched a living, some achieved greatness, but many sank into lives of poverty and squalor. The following are a mixed bunch of performers of whom some are traceable for a good number of years while others tried to find their way with no mention in the publications of the time. Edna Mayne is described as the Rembarkable Toe Dancer and in January 1911 we find her at the Palace Theatre, Gloucester, in Puss in Boots. She is described as an exceedingly clever sand dancer while her work on her toes was said to be very smart. A sand dance has been described as an eccentric dance with exaggerated movements while dressed in an approximation of Egyptian style. Annie Casey is variously described as a comedienne, serio and dancer. The first listing I can find for her is 1896 and by 1904 she was doing well enough to put a notice in the trade paper, The Era. She tells us she has no vacancies in 1904 and 1905 but five weeks vacant in 1906. Reports of her become scarce after 1909 although in 1911 she is on the bill at the North Seaton Hippodrome as a vocalist and chorus singer. In 1913 a notice in The Era placed by the MHARA (Music Hall Artistes’ Railway Association) asks for information on the addresses of various performers, including Annie Casey. The MHARA negotiated reduced fares on the railway for it’s members. I’ve seen a postcard of Will and Annie Casey but can’t find evidence of them performing together. She had a brother called Will, this information coming from their mother’s obituary which was placed in a trade paper. According to her postcard Miss Etta performed a disrobing act on the trapeze. From the trade paper of the time, The Entr’acte, dated March 21st 1903 we learn she was due at the Alhambra on the following Monday evening. Ten years later, in 1913, there is a reference in The Era to Mlle Yetta whose act is on a high wire. ‘She disrobes, picks up a handkerchief, gives a very clever dance—a splendid turn this.’ There is a reference to Miss Etta in an American publication so she may have been from the States. More research! Lastly, the Sisters Earle, of whom I can find no trace other than the photograph they left behind. They look like real sisters and greet us cheerily with a salute. If anyone can come up with information about these two performers, or any of the others mentioned in this post, I’d love to receive it. The great-nephew of the Sisters Earle has contacted me to say that they were Florrie and Harriet Warsaw from a family of performers. Their brothers were Ernie and Dave, who performed as the Warsaw Brothers and their younger sister Doris was a pianist who performed as Doris Crawford. Around 1901 they were living in Broken Hill, Australia but were living in London by 1911. Thank you so much for the information, Mike. This entry was posted in Comedienne, Music hall artistes and tagged Annie Casey, Edna Mayne, Florrie and Harriet Warsaw, Florrie Warsaw, Harriet Warsaw, Mdlle Yetta, Miss Etta, sand dancer, Sisters Earle, toe dancer on December 2, 2016 by Monomania. Daisy Jerome was born in the States in 1888 but moved to England as a child when her father suffered a financial crisis. Money was needed and she followed her sister on to the stage. She was a small, dainty figure with bright red hair, compelling eyes and an expressive face. Her appearance belied her risqué performances and her hoarse, sensual voice. She was a toe-dancer and a wooden shoe dancer, but best known as a mimic and comic singer. Daisy married Frederick Fowler in 1906 but they lived together for less than a year with Fowler blaming the marriage breakdown on the constant presence of his mother-in-law. He filed for divorce on the grounds of Daisy’s misconduct. She was living with Mr Cecil Allen in Battersea by this time and claimed Allen would marry her if she was divorced. The decree nisi was granted with Fowler saying he would shoot Allen if he didn’t marry Daisy. She left for a three year tour of Australia shortly after accompanied only by her mother. She adopted the name ‘the electric spark‘ and seems to have lived up to this in her public and private life. In February 1910, before the divorce, Daisy took out a libel action against the Walsall Observer who had reported that ‘Daisy Jerome, without much provocation, is constrained to give three more than usual number of songs we get from one artist.’ The insinuation was that she gave encores when they were not required and this was a serious allegation with regard to future bookings. Daisy said she was not at all anxious to give encores but that she ‘made one of the hits of my life in Walsall.‘ The journalist replied that the house was a poor one on that night and that Miss Jerome received very little applause. He felt his article was a fair one. Daisy was awarded one farthing in damages. In Australia in 1923 Daisy, now married to Captain La Touche took her maid to court for stealing and pawning some of her clothes and jewellery. Her maid, Cecil Lightening, said she was innocent and had only followed Daisy’s instructions. The maid had been told on one occasion that her employers were hard up and that she, the maid, was there to bluff the public and to bluff them into giving Daisy a big salary. The maid was acquitted. At last the young fellow exclaimed with a leer am I the first you have ever loved dear? And the parrot said, YES THIS WEEK! This entry was posted in Daisy Jerome, Music hall artistes, Music Hall court cases, Music Hall songs and tagged Australian Music Hall, Daisy Jerome, Marie Lloyd on October 30, 2016 by Monomania. Following on from the previous blog we find the music hall artistes determined to stand their ground and the music hall managers refusing to recognise the Variety Artists’ Federation as the mouthpiece of the industry. In late January 1907 it was announced that a group of artistes had signed a twenty-one year lease of the Scala Theatre. The theatre would be run as a music hall with one house a night and the programme ‘comprising the cream of star talent’ with the ancillary buildings being used as the headquarters for music hall associations and as a music hall exchange. The performers hoped to control their own destinies but the trade paper The Era was of the opinion that the VAF had taken a very daring step. The ‘housewarming’ at the Scala for artistes was fairly well attended but many performers were absent on picket duty. As proprietors they would act fairly and were sure that the theatre would be packed to the doors every night. On the opening night there was mention of Mr Oswald Stoll who had barred an artiste from appearing at Crouch End for two and a half years and also had sent a representative to ask performers the question, ‘Are you in favour of a strike?’ It was assumed that an affirmative answer would mean the artist would not be employed by his syndicate. This was considered mean and despicable. Despite the excitement and enthusiasm both sides were suffering financially in the dispute and there was a feeling that the executive committee had rushed into action without sufficient consultation. The ‘stars’ had a meeting with the managers and announced they had made headway with their demands but the VAF felt sidelined and were not in favour of a settlement. Eventually the dispute went to arbitration, chaired by Mr Askwith from the Board of Trade. The strikers were not to perform at the Scala or to picket the halls and the managers were to drop any legal proceedings against individual performers. The Alliance closed the Scala, having leased the premises for four weeks at a cost of £1,200. There were three interim awards and a final award, made more complicated by the fact that musicians and stagehands had joined the strike and employment needed to be found for them. Improvements were made to the hated barring clause, each matinée would be paid for and artistes would have definite appearance times so that low paid performers could rely on appearing in two halls a night rather than the manager changing the order of the bill on a whim. Both sides agreed to abide by the points of the arbitration agreement but later it was suggested that some managers were trying to go back to their old ways. In fact in 1908 Oswald Stoll threatened a lock-out of performers over a dispute with the VAF over charity matinées but it was pointed out this went against the terms of the arbitration award. Again in 1914 the same owner/manager dismissed members of some London music hall orchestras who refused to sign an eighteen month no strike contract. The orchestras of two Manchester music halls walked out in sympathy leaving only the conductor and a harpist. A court case ensued with the judgement going in Mr Stoll’s favour and the musicians paid damages and costs with Oswald Stoll agreeing to accept payments of five shillings a month. In the London halls he said that as many of the men would shortly be joining the army he had made arrangements for women’s orchestras to take their place. The newspaper headline reads ‘STRIKE OF MUSIC HALL MUSICIANS? Places to be taken by women.’ Hmmm. I haven’t been able to find a full list of strike supporters but the artistes in the above postcards were performing at the time, may have supported the strike or been affected by the picketing of the halls. This entry was posted in Music hall artistes, Music hall contracts, Music hall strike, Music hall war and tagged Annie Purcell, Daisy Wood, Gertie Gitana, Jane May, living statuary, Marie Tempest, Oswald Stoll, Scala Theatre, Variety Artists Federation on September 24, 2016 by Monomania.